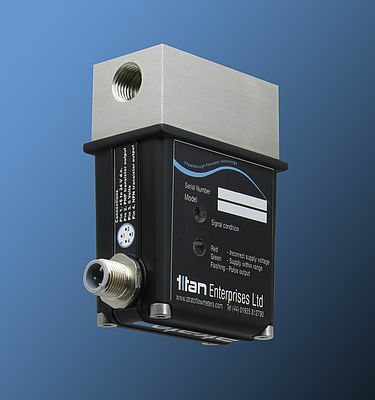 Titan Enterprises presents the Process Atrato - a new low volume, high performance ultrasonic flow meter packaged to address the challenges of the process and control environment. The compact Process Atrato flow meter combines all the technological advantages of market-leading Atrato ultrasonic technology (high linearity, high sensitivity, wide flow range linearity, no moving parts, fast response time, can be installed anywhere) with a new durable construction. Built from 316 stainless steel and PEEK - the Process Atrato is supplied sealed to the IP65 standard. The combination of durable housing and top performance, in a very reliable flow meter, delivers a new tool for engineers at a reduced cost of ownership compared to existing flow measurement technologies serving the process and control market. Rated for use up to 65°C and 20 Bar the Process Atrato is available in 4 models operating over flow ranges from 2 ml/min to 15 litres per minute, accuracy is ±1% over the whole flow range. Each Process Atrato is calibrated with a pre-set 'K' factor so all meters of the same flow range are fully interchangeable simplifying assembly and set-up procedures for OEM manufacturers looking to integrate the flow meter into their process and control set-up.As standard the Process Atrato comes with two frequency outputs (PNP and NPN). Two multicolour LEDs indicate signal strength, power malfunctions and pulse outputs. Electrical connections are through a standard M12 four pin, sensor connector. Using patented technology that enables it to operate with excellent accuracy over very wide flow ranges, the Atrato range of inline flow meters is a genuine breakthrough in flow meter technology. The advanced Atrato signal processing system permits flow measurement across the whole Reynolds number range allowing both viscous and non-viscous products to be metered anywhere.